You just never know what your wedding day will bring. Every bride hopes for sunshine on this magical day but it's so unpredictable and you just have to go with the flow. When its your wedding day, it'll still be perfect. The most important part is that you get to walk down the aisle and marry your best friend. To have and to hold forever. Irina & Mathew's wedding was just that, "perfection". We started off the day at their homes in Staten Island before heading to the Staten Island boardwalk for some wedding pictures. The rain couldn't and wouldn't stop us their Staten Island wedding photographer from making sure the photos were just as they dreamed and for them to cherish forever and look back on and smile. Throughout the day it drizzled but they remained happy and always smiling. 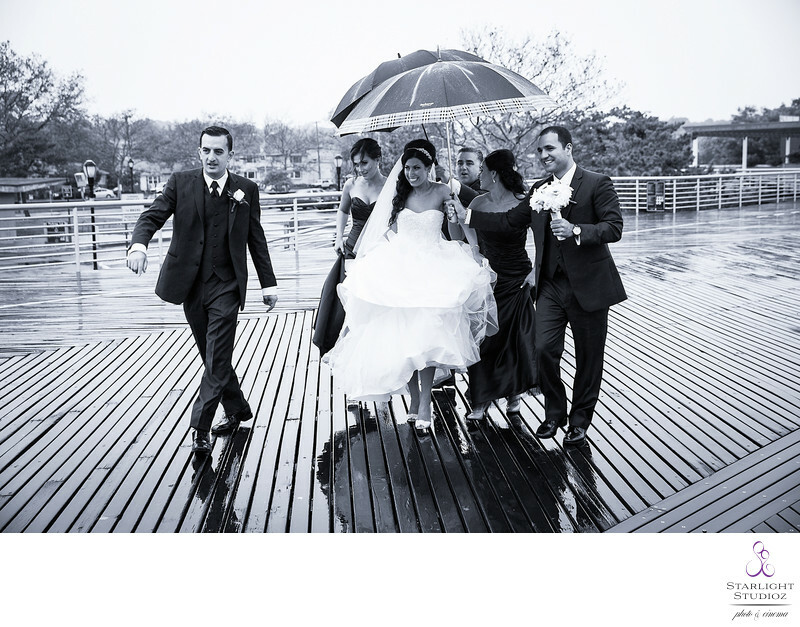 This black & white photo holding umbrellas in rain of Irina & Mathew walking to the boardwalk with their bridal party is one of my favorite candid photos. We love what we do and that makes us the best decision for couples selecting their Staten Island wedding photographer. After finishing up photos on the boardwalk we headed to their venue in Brooklyn, Riviera Caterers to take more photos inside of venue and ballroom as it continued to rain. We were able to capture some stunning photos by the grotto once the weather began cooperating closer to the evening time. The Vanderbilt at South Beach is a wonderful wedding venue located in Staten Island. One of the few locations in the NYC area where you can have your ceremony right on the beach. A few years ago we captured the very memorable and fun wedding of Mary & Edward who exchanged there vows right on the beach and moved into the ballroom for the reception. See a glimpse of their wedding highlights below.